On Monday 8th October 2018, in collaboration with Pyxis, Engineering and MHT, the IMA Group will be pleased to present some of the recent developments the organization has made in relation to the fourth industrial revolution. 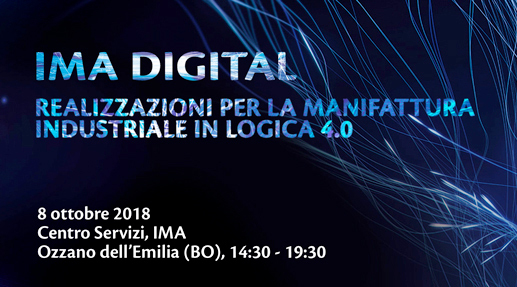 This workshop for companies based in Emilia Romagna will explore the integration of digital technologies into industrial processes and the digitalization of manufacturing processes. Particular focus will be placed on IMA Digital, IMA’s long-term plan to build a smart factory for smart products. The workshop will be held at the IMA Service Centre.